The Budding Cook: Warm wishes for a wonderful Onam. Warm wishes for a wonderful Onam. Onam greetings to all Keralites ! happy onam to you and yours!! Happy Onam! And thanks for your comment at our blog. Happy Onam to you too Tbc!! Lovely picture! looks like the lamp is burning on our computer screen! Happy Onam to you and your fly! 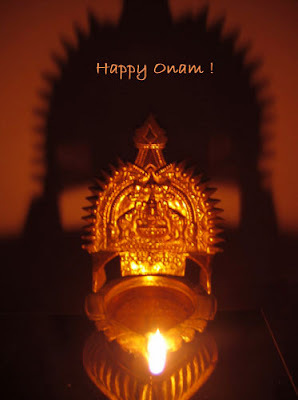 Happy Onam to you and your family.